Remember the adorable droid C-3PO from the Star Wars movies? Envision something along similar lines and you have ‘Atlas’. Sci-fi is no more just a fantasy! Boston Dynamics, as a part of the DARPA Robotics Challenge, created and then re-developed the flexible humanoid robot, that is dexterous, sturdy and highly mobile in order to perform tasks such as carefully lifting objects, using tools, walking on two legs, climbing using both hands and feet with a high level of coordination, being articulate with movements and all this even in constrained and difficult terrains. For these purposes, Atlas has 28 degrees of freedom in its lower and upper body, which are fluid-run (for reference, the human body has 244). The biped bot is powered by stereo cameras, a 3.7kW/hour battery that lasts for an hour of effort, inbuilt with a pressure pump for smooth and quiet functioning, computers for perception, and a router propped on the head for communication. Not to forget, its height of about 6 feet and weight of 300 lbs in titanium! 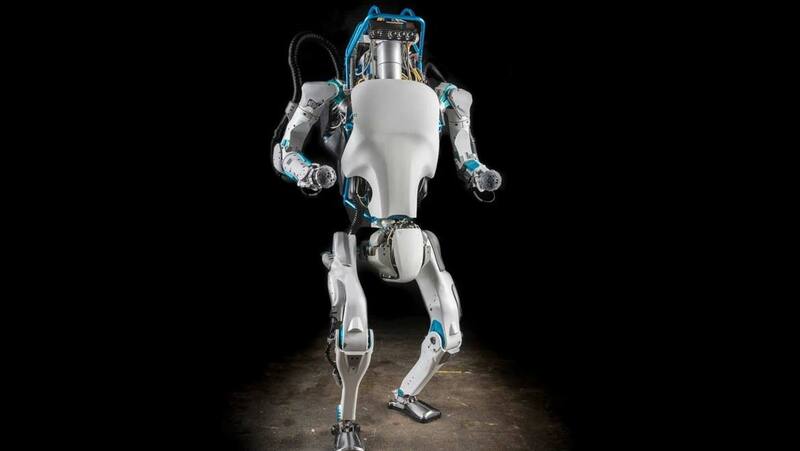 Co-creator Raibert said, “The engineering team did a huge amount of work to make Atlas lighter and more compact” and that customized valves and 3D printing were used to construct body parts where hydraulic lines were a part of the initial framework and not separate entities, this in turn rendering the robot more effective and efficient. Questions regarding the balance of an untethered Atlas were investigated to which the researchers of this work-of-art have described its design and bipedal treading technique: before taking a complete step, the robot inspects the contact surface after which it displaces its weight onto the other leg to move forward by a small rotational motion of the foot around the corners. This humanistic robot does not possess prior knowledge of an area hence making the task of traversing on new terrains, without falling, a true test of its agility and equilibrium. Repeated refining of the algorithms has succeeded in ensuring the same. Besides the fact that this automaton can comfortably navigate uneven ground, it’s amazing how it does so with utmost poise! In case of emergencies, a ‘stop’ button can be wirelessly activated. Possibly the world’s most advanced robot, Atlas, finds immense application in astronomy and aeronautics, robotics and disaster relief and management where humans are performance-challenged. What remains to be improved upon is the speed at which it advances, which currently is slow, the actuation and control technologies, and in the future, attaining an intelligence exceeding or at least comparable to that of the higher mammals.